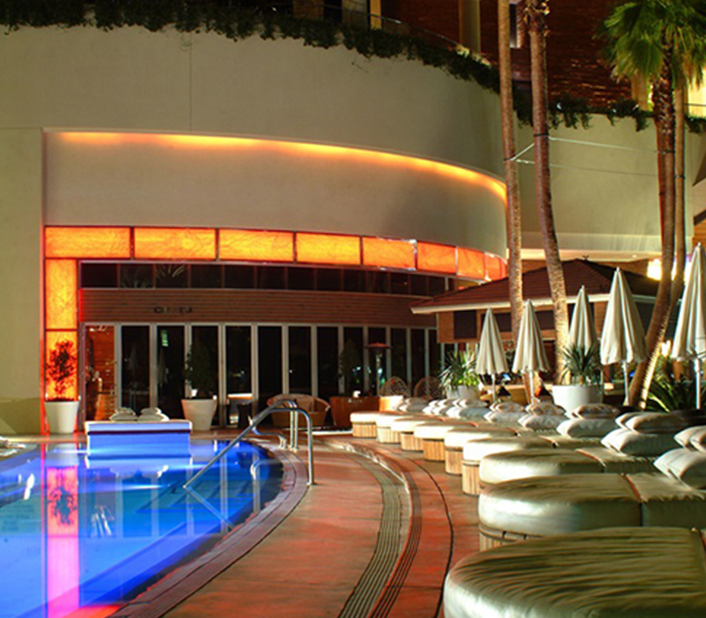 The shining star at the Red Rock Casino, Resort and Spa is the hotel’s expansive pool area. With one main heated pool and eight smaller pools bordered by cabanas, this unique centerpiece is a sight to be seen. The main pool features an interactive fountain, while the wading pools and private pool areas offer a more intimate soaking experience. There is also a beach for those who want an authentic day of swimming, lounging, and relaxing under the sun. Red Rock Pool spans across more than three aces of property. Over the several acre property sits 19 private cabanas, beach area, wading pools, an island fountain, and a poolside café. The space is big enough to enjoy quiet and tranquility as you simply lounge in the sun, or dance and socialize with other scarcely-dressed party-goers. At the poolside café, guests can enjoy bites of refreshing appetizers, chilled cocktails, and a wide menu of specialty beverages. The pool area also serves as an entertainment venue, hosting concerts and various special events. If you’re in the mood to swim, you’re in luck. The main pool is open year-round and is the only pool at the Red Rock Casino, Resort and Spa that is heated. The other eight smaller pools that are spaced out between the cabanas are non-heated, and only open during the warmer months of the year. For guests looking to warm up when the weather gets chilly, the venue has two spacious Jacuzzi tubs. Soak in one of the pools or hot tubs, or relax in one of the plush lounge chairs, water chairs or daybeds, which are available on a first come, first serve basis. Guests also have the option to engage in some fun and games right by the poolside. The venue features blackjack tables where guests can try their luck and potentially make some cash. With the ability to host up to 3,000 people, there are frequent concerts and live events throughout the year. The main pool is open to hotel guests for free year-round. The only requirement is to show your room key-card upon arrival. 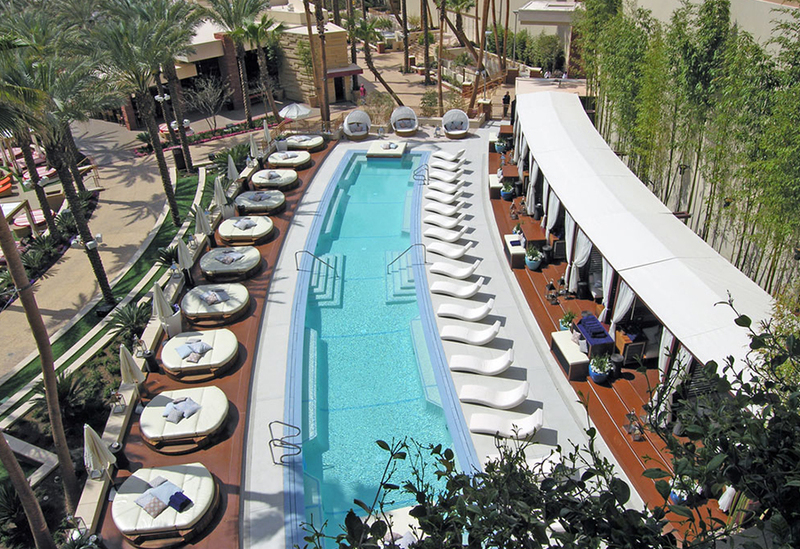 There is also no cover charge for the Cabana Club, which is a rectangular pool area. If you want some privacy during your stay at this Las Vegas pool club, be sure to reserve your private cabana. Each of the venue’s 19 cabanas feature a ceiling fan, misting fan, two chairs, padded couch, TV, and refrigerator filled with water, fresh fruit and juices. The prices for cabanas range depending on the day of the week. The average price for cabanas from Monday through Thursday is $150. 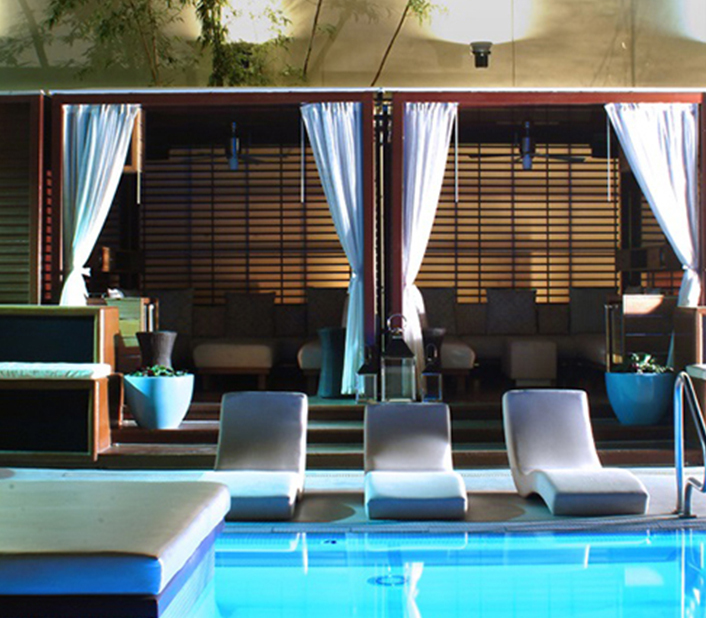 From Friday until Sundays, cabanas are typically $250. If you want a cabana during a holiday event, you can expect to pay around $300. The service at the Red Rock Pool is always friendly and prompt. Everything you could ever need at a pool club is delivered right to your chair, including soft towels, delicious food, and frozen alcoholic beverages. If you want to move from your lounge chair, take your towel over to the beach and lay in the warm sand. The daybeds are also spacious and allow for privacy when the curtains are shut, or fresh air when opened. 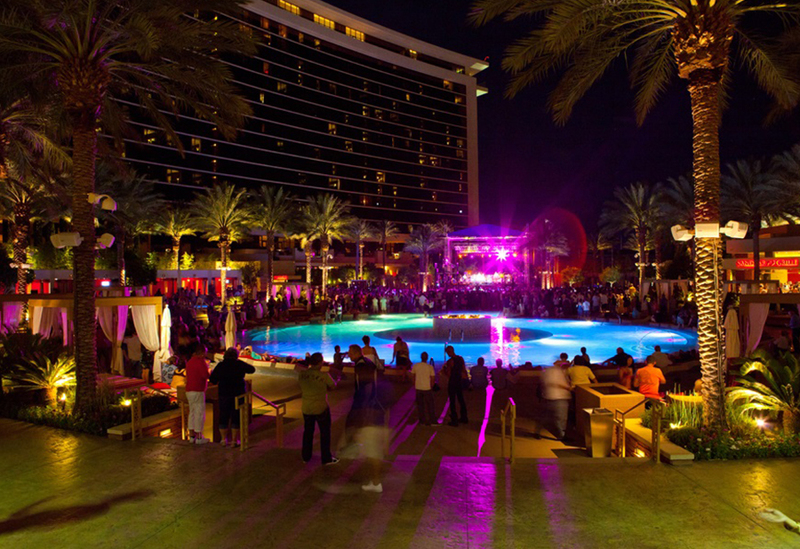 If you’re new to the Las Vegas pool party scene, you’ll want to take the time to visit the backyard pool complex at the Red Rock Casino, Resort and Spa. With numerous pool areas, a beach, and plenty of comfy outdoor seating, the complex is the perfect place to cool off, enjoy some good food and cold drinks, or just relax during your visit to Sin City.